Considerable interest in new single-photon detector technologies has been scaling in this past decade. Nowadays, quantum optics and quantum information applications are, among others, one of the main precursors for the accelerated development of single-photon detectors. Capable of sensing an increase in temperature of an individual absorbed photon, they can be used to help us study and understand, for example, galaxy formation through the cosmic infrared background, observe entanglement of superconducting qubits or improve quantum key distribution methods for ultra-secure communications. Current detectors are efficient at detecting incoming photons that have relatively high energies, but their sensitivity drastically decreases for low frequency, low energy photons. In recent years, graphene has shown to be an exceptionally efficient photo-detector for a wide range of the electromagnetic spectrum, enabling new types of applications for this field. Thus, in a recent paper published in the journal Physical Review Applied, and highlighted in APS Physics, ICFO researcher and group leader Prof. Dmitri Efetov, in collaboration with researchers from Harvard University, MIT, Raytheon BBN Technologies and Pohang University of Science and Technology, have proposed the use of graphene-based Josephson junctions (GJJs) to detect single photons in a wide electromagnetic spectrum, ranging from the visible down to the low end of radio frequencies, in the gigahertz range. 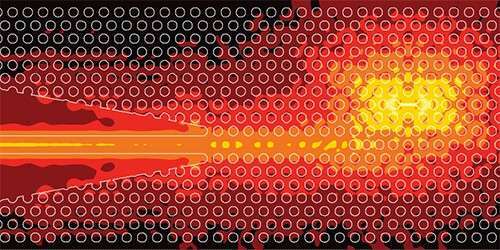 In their study, the scientists envisioned a sheet of graphene that is placed in between two superconducting layers. The so created Josephson junction allows a supercurrent to flow across the graphene when it is cooled down to 25 mK. Under these conditions, the heat capacity of the graphene is so low, that when a single photon hits the graphene layer, it is capable of heating up the electron bath so significantly, that the supercurrent becomes resistive – overall giving rise to an easily detectable voltage spike across the device. In addition, they also found that this effect would occur almost instantaneously, thus enabling the ultrafast conversion of absorbed light into electrical signals, allowing for a rapid reset and readout. The results of the study confirm that we can expect a rapid progress in integrating graphene and other 2-D materials with conventional electronics platforms, such as in CMOS-chips, and shows a promising path towards single-photon-resolving imaging arrays, quantum information processing applications of optical and microwave photons, and other applications that would benefit from the quantum-limited detection of low-energy photons.